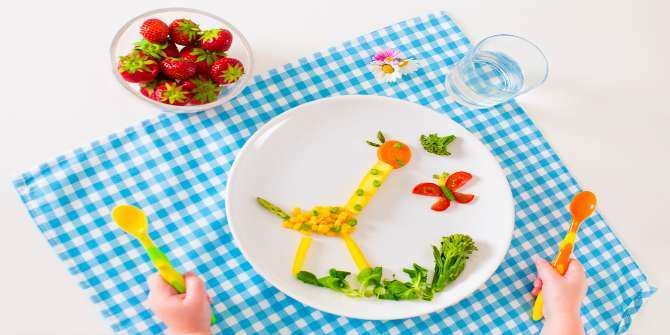 Eat, play, love...what are his favourite weaning foods? I just found out that my ex-boss has adopted a baby girl. He was venting about having trouble with baby food and going slightly nuts trying to please his six-month-old’s palate. Now, I found this slightly ironical because he tells the world what to eat through his blog and is never at a loose end for ideas. When I got thinking, I was reminded of frequent queries posted on a mom-baby network that I am a part of on, “What to feed the child?” and I wondered how this whole baby food lacuna came about. The answer stared at me in the face as I saw my son reaching out for the red pepper in yoghurt dip on my plate in preference to his mashed potatoes with carrots at Gaia on our recent Goa jaunt. He also looked slightly disdainful that I was spooning it with a baguette. He went for it neat, licking his fingers clean. He is all of 17 months. Babies want the good stuff, dammit. The term baby food is condescending. I think at some level, they know that we are eating all the good (and good-looking ) stuff and they are getting all the guck and mush. Now I’m not asking you to shove a steak or biryani or tandoori chicken or chhole bhature down your child’s throat. All I am saying is, show a little respect for the child. Why shouldn’t its food be good-looking? Would you eat what you are expecting it (I will be saying ‘it’ instead of he/she, no offence) to eat? Food is all about seduction, and maybe I am watching too much of Master Chef Australia, but what looks good is usually more inviting to eat, so why shouldn’t it be so for a baby? Yes, I know there is the whole pureed foods phase upon transition from ‘fully breast’ to solids the minute the clock strikes ‘six months’ or the child looks wistfully at your plate, whichever is earlier. And I do know that it would be deemed ‘cruelty to children’ giving them stuff to chew when they have no teeth. But the minute they have a few to reckon with, go for it. They are ready for the real thing. Your culinary adventures can begin. Around eight to nine months is when you can start having fun. There are two simple rules really. Colour and texture. So mashed potatoes or carrots can get a bit of art direction with some green thingees in them, ala peas or beans. Even a khichdi need not look its traditional bilious yellow and have some shredded carrots, peas, beetroot and bits of palak in it. Or you can mix different coloured boiled veggies and sautee a bit with caramelised onions instead of feeding a monochromatic mush of kaddu or beetroot or whatever. Idlis can look less boring with speckles of carrot of red pumpkin in them. They could even be green or pink if you blanch and puree some spinach or beetroot into them. So also with chilas and spring onions. Or you can serve up a bed of baby potatoes (boiled, of course) sautéed in butter and herbs and watch their faces light up. And imagine how empowering it must be to bite into a monster sweet potato? Dosas are my favourite, because you can almost add anything to the batter, right from carrots to beans to tomatoes to pumpkin to capsicum to cabbage to paneer to cheese. Chapattis can be micro sized, to let the little ones know that you have concern for the size of their plates. And it’s never too early for a simple aloo paratha with just a tinge of spice. Only, don’t ever pre-break their food. Let them tear the stuff apart, it’s part of the adventure. I am not one for snacking, so it’s mostly fruit in between meals. Or perhaps, a bread stick or raisins or dates or dried figs or a once-in-a-while cookie (the less sweet, the better. You don’t want an orthodontist to add to your list of things to do in the next two years, right?). I recently made a kurmura chivda that my son loves to eat and play with. Sometimes, a toast with peanut or cashew butter (you can make this at home, will share recipes) or even a nice-looking sabzi could work as a snack. When it comes to fruit, all that juicing and diluting or pureeing is a whole lot of baloney. Thrust a slice of a bright orange papaya or a luscious musk melon or a slutty watermelon or even a happy yellow mango in front of them and see how much fun they have. For me, “when in doubt, fruit” has always worked. As much as they can have, as often as they want to. The earlier you start, the better. Some mothers hold off on giving fruit for really long and then whine about how the child never wants to eat anything healthy. Yes, it’s messy, and yes you have to clean up, and yes, there are flies, but it’s so worth it. So whenever the question of, ‘What to feed the baby?’ pops up, think of what you want to eat, and work around that so the baby can eat it too. So if it’s an upma, go easy on the chillies, oil, etc, add vegetables for colour, texture, substitute rava for dalia once in a while, and there you are. Your upma is his upma. Ditto for everything else. The boy was last seen packing a ladle into his ‘going out’ bag. I am secretly excited. I can’t wait to start cooking and baking with him. 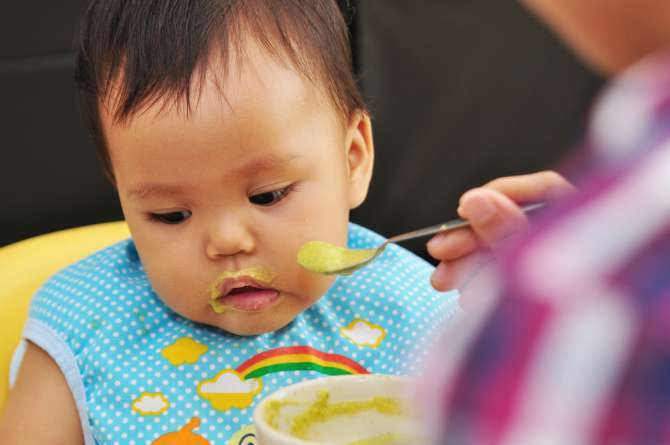 Do you have any questions regarding this article on weaning foods? Please share in the Comment box below.